Happy Thanksgiving and Happy Chanukah everybody! Hope everyone who celebrates is enjoying the holiday and relaxing a bit. I also hope you’ve indulged in some good foodie fun! Because Chanukah and Thanksgiving only coincide once every 70,000 years or so, KOL Foods selected a group of eight bloggers to come together and share eight days of fabulous turkey recipes with you! At the end of Chanukah, you will have the opportunity to vote for your favorite Thanksgivukkah recipe and you’ll also have the opportunity to win $200 in credit towards your next KOL Foods purchases! Learn more about the contest here. If you aren’t familiar with KOL Foods, they are the only source online for domestic, 100% grass-fed, kosher beef and organic, pastured, kosher chicken, turkey and duck. We’ve been celebrating Thanksgiving for the past few years with an assortment of good friends and family. The great turkey debate happens in the house each year. Our friends and family are a mixture of vegetarians and meat-eaters, and there is always a discussion of whether to change things up to a dairy Thanksgiving dinner. Somehow, tradition always wins out, and a giant turkey is prepared. Somehow, the turkey business always lands in my kitchen. I usually rely on my parents for trusty Thanksgiving turkey recipes. The giant 20-pound birds often intimidates me. I decided to come up with my own bird ideas this year. Each year when we make the turkey, there always seems to be a race to the favorite turkey parts. In our gaggle of friends, the thighs and wings seem to be the most popular. Probably because they retain a lot of turkey flavor and juice. Unfortunately for us, turkeys only have two thighs and two wings. This year, I decided to forego the whole turkey and only cook up the various turkey parts that our guests prefer. 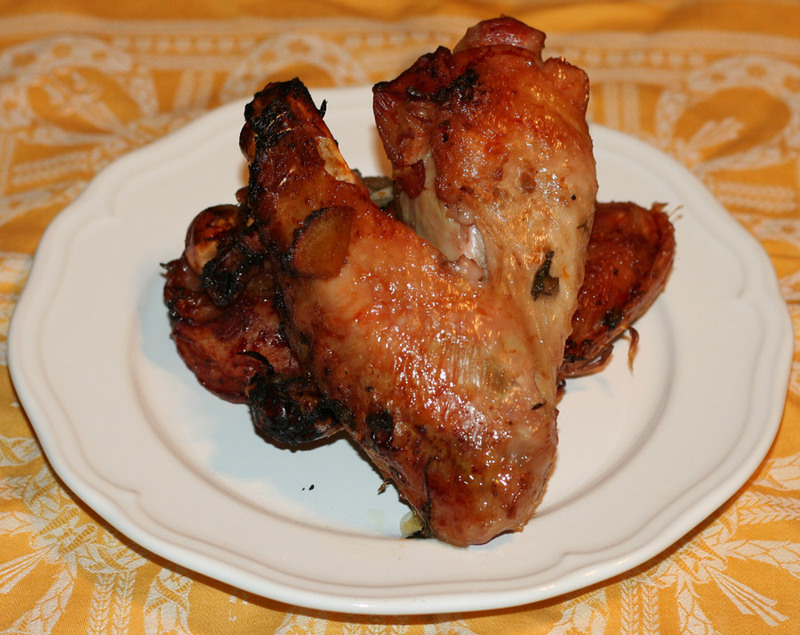 I love using pastured, grass-fed turkey and KOL Foods sent me some turkey wings to work with. I decided to go with a maple bourbon glaze for my turkey. I’ve done a similar glaze on chicken and thought it would work well with turkey. I preheated the oven, then I sliced some onions and laid them in my roasting pan, along with some cubed sweet potatoes, acorn squash, garlic and herbs. I used a combination of fresh thyme and fresh sage. I laid the turkey on top of the cubed veggies and stuffed some additional herbs and garlic under the skin. I ground some salt and pepper over the turkey skin. In a bowl, I mixed together the maple syrup, olive oil, bourbon, soy sauce, dijon mustard, garlic paste, apple cider vinegar, chopped sage and thyme. I poured everything over the turkey and veggie mixture. I then baked it in the oven for about an hour and a half or so. I checked on the turkey a few times to baste with the pan juices and to make sure that the turkey skin wasn’t burning. Some sort of magic happened in that oven. As I pulled the turkey out of the oven, even I, the turkey hater, was tempted to take an early bite of these turkey wings. That crispy skin promised to be amazing. Good news. The turkey did not disappoint. If you have some leftover turkey wings (or other parts) from your recent turkey feast, I would recommend you lightly brush on some of the sauce and bake/reheat the turkey at 325 until heated through to a safe temperature. Keep in mind, for a few small pieces, you do not need as much sauce. It is a great way though to refresh a bland or drier turkey. You could also chop up leftover turkey and pan fry with some of the glaze and chopped veggies and onions. It tastes amazing. We did this with a leftover semi-dry turkey breast and it totally revived the turkey! Check out the recipe below and then head on over to KOL Foods to enter to win $200 in KOL Foods credit! 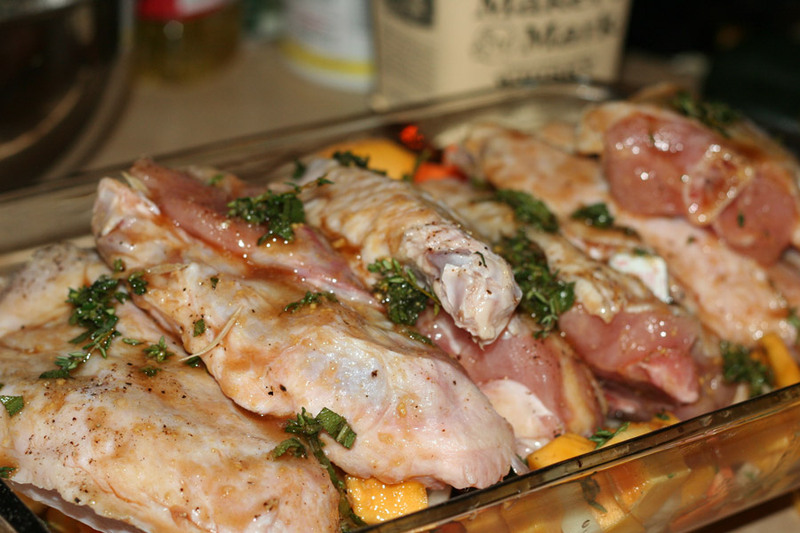 Place the turkey wings over the veggies and onions. In a mixing bowl, mix up the bourbon, maple syrup, olive oil, vinegar, garlic paste, mustard and soy sauce. Mix in about a third of the herbs. Pour the sauce mixture over the turkey. Sprinkle the remaining herbs and garlic over the turkey. Bake in the oven for about 1.5-2 hours. Check and baste the turkey every 30 minutes. This looks delicious! I can’t wait to try it- we love turkey in our house! I agree with your friends – pass the wings please! That looks really good, and I don’t usually eat chicken wings! I always buy extra wings because we all want one! And I make them throughout the year. This is a tasty sounding glaze. My hubby would LOVE these. Yum!